Anthropogenic Emissions: Emissions of greenhouse gasses resulting from human activities. Carbon Offset: A carbon offset is a service whereby the benefit of implementing a greenhouse gas emissions project in one location “offsets” or equalises, green house gas emitting activities in another location. Carbon Dioxide (CO2): CO2 is a colorless, odorless, non-poisonous gas that is a normal part of the ambient air. Of the six greenhouse gases normally targeted, CO2 contributes the most to human-induced global warming. Human activities such as fossil fuel combustion and deforestation have increased atmospheric concentrations of CO2 by approximately 30 percent since the industrial revolution. CO2 is the standard used to determine the "global warming potentials" (GWPs) of other gases. CO2 has been assigned a 100-year GWP of 1 (i.e., the warming effects over a 100-year time frame relative to other gases). EU Climate and Energy Package: published in January 2008, sets out proposals to achieve a reduction in EU greenhouse gas emissions of 20% by 2020, increasing up to 30% by 2030 in the event of an international agreement on climate change, compared to 1990 levels. UNFCCC: The Kyoto Protocol is an international agreement linked to the United Nations Framework Convention on Climate Change (UNFCCC). 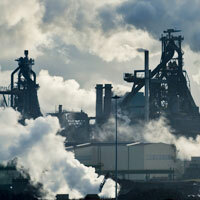 The UN convention encourages countries to stabilise GHG emissions. The Kyoto Protocol commits them to targets and is the first global legally binding contract to do so.